The Kawasaki ER-5 is a naked commuter motorcycle. This Japanese workhorse is powered by a liquid cooled 4 stroke DOHC 498 cc engine based on the design used in the Kawasaki GPZ500, producing around 50 bhp. It is capable of a top speed of around 110 mph (175 km/h) and usually lasts around 55,000 Miles. It is a favourite among training schools in the UK and around Europe because of it's relatively low maintenance costs and forgiving nature. The handling is unexceptional, but the standard Dunlop Arrowmax tires provide quite good footing. They do, however, tend to slip in wet or rainy conditions. Many users choose to change them for Bridgestone BT45's. Overall it is considered to be a good "first bike", as it survives being dropped more or less unharmed, is easy to work on and easy to get spare parts for. It also gracefully accepts being restricted to 33BHP/25KW, which is the maximum power output permitted for certain types of restricted licences within Europe, adding to its appeal for beginners. 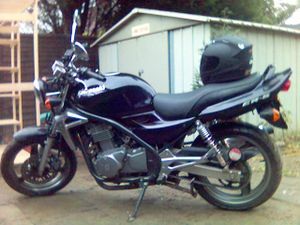 Kawasaki GPZ500- More powerful than the ER-5 and started its life out as a budget sports bike. 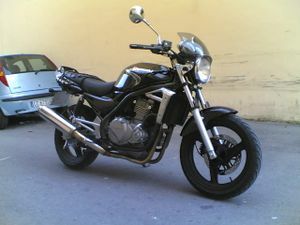 Suzuki GS500 - Another bike that is popular with training schools. Honda CB500 - Honda's contribution to the 500s. There are, of course many other 500 cc motorcycles but these are the most popular and new biker friendly. Despite these faults, the ER-5 has built up a reputation as being cheap to maintain.